What’s in Our Museum Collections? Native American mortars and pestles, duck decoys, license plates, spinning wheels, cabinetmaker’s planes, ferry boat signs, medical implements, Edison phonographs, patent models, samplers, the door from Benjamin Franklin’s 18th-century print shop, quilts, political memorabilia, currency, leather cutter tools, a 300-pound brush salesman’s 1905 portable trunk, ship models, kitchen utensils, light devices, armaments and toys are only a few examples of the items in the collection that document and reflect the changing patterns of life in New Jersey. Grain Shovel, maker unknown, 1750-1850. Shovels and other farming tools used by farmers in the late 18th and early 19th centuries were often crafted by carpenters or blacksmiths. Since metal was in short supply, wood was the primary material used in such tools. Weathervane, maker unknown, probably Succasunna, Morris County, New Jersey, 1809. The weather vane helped the early New Jersey farmer to predict the weather, which enabled him to plan his daily chores. Weather vanes were also status symbols for landowners and landmarks for travelers. Baseball glove, Charlie Keller model, about 1940. 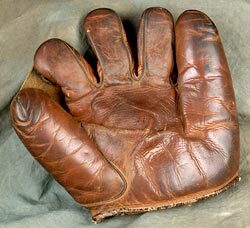 This fielder’s glove is stamped with the name “Charlie Keller,” who played for the New York Yankees in the 1940s. Before playing for the Yankees, Keller was one of the top players in the minor league Newark (New Jersey) Bears, who won the 1937 championship. 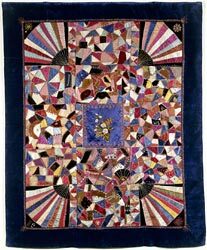 Crazy Quilt by Mrs. William A. Jones, New Jersey, about 1885. Like many other women who made quilts during the Victorian era, Mrs. Jones designed hers using irregularly shaped pieces of material and joined them together with elaborate needlework. What else is in our collections?